The most vicious and dangerous fantasy football tournament you will ever encounter! Dive into the action as a rag-tag team of humans, the Hochland Harbingers, attempt to claw their way to the top of the Blood Bowl league! Can Dreng Sturmblud, a former star player who has crashed to rock-bottom, help the Harbingers fend off the terrifying opposition?! 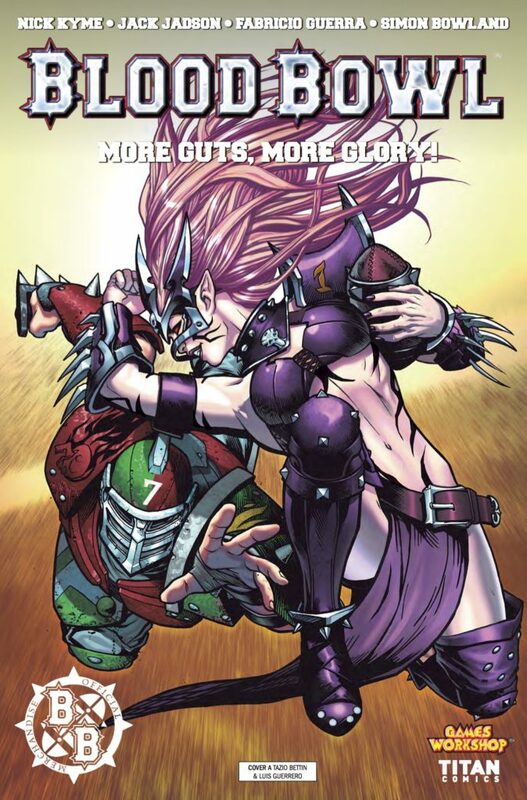 Bone-crunching sports action in the fantasy world of Warhammer, written by Nick Kyme (Warhammer 40,000) with art by Jack Jadson (Teen Titans, Birds of Prey) brand-new edition of the board game has been a runaway success – adding to the game’s global appeal and huge fanbase! 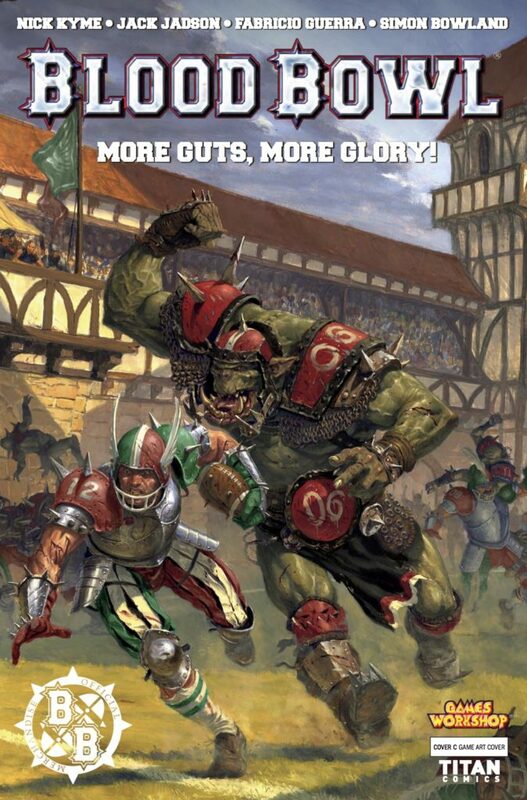 Titan Comics has put the fantasy in fantasy football with Blood Bowl: More Guts, More Glory, a Warhammer world full of epic, on the field action. The Hockland Harbingers are making their way to the Blood Bowl by pulverizing opponents piece by piece. 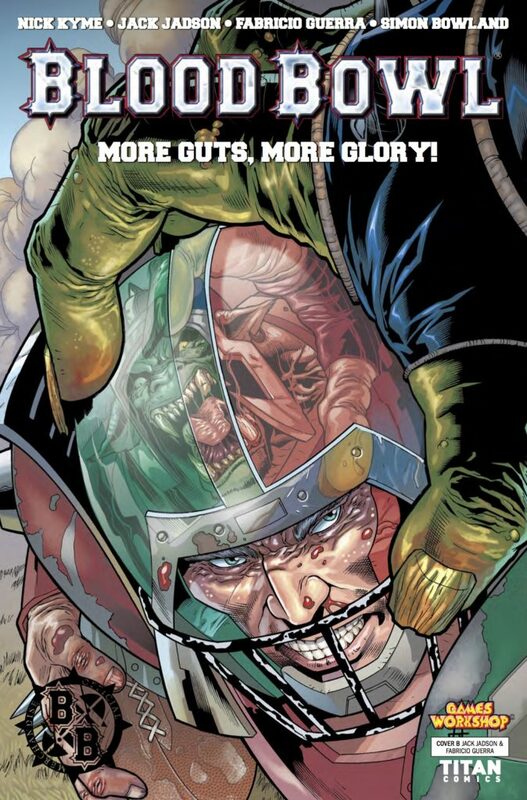 Hogan Hellhammer keeps the team focused, in spite of Gorgeous Gerrick and his womanizing ways. Writer Nick Kyme keeps the story interesting with a fresh take on fantasy speak, all while maintaining a fierce pace of power hitting and bone crunching on the field. Artists Jack Jadson and Fabricio Guerra bring their visual genius to life with crisp art and bold colors. This is a fun read with quick humor and endless action. I loved it!